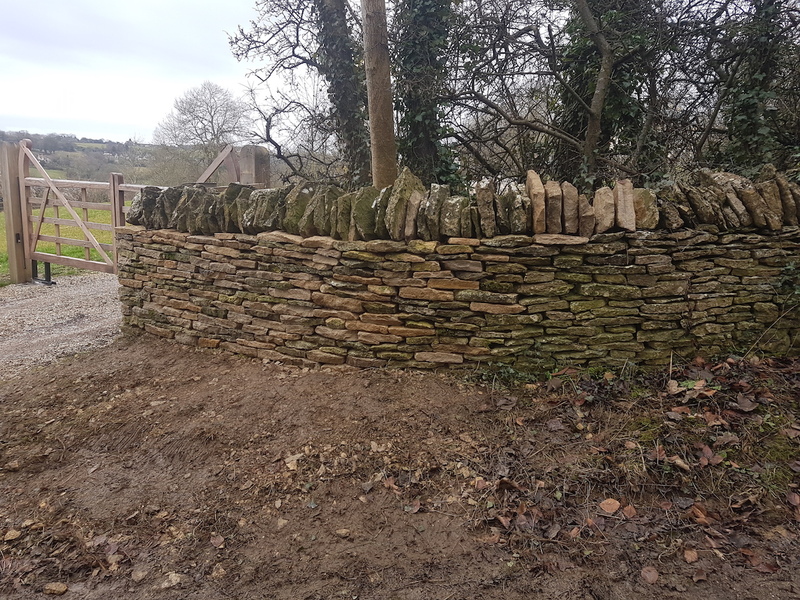 2018 proved to be yet another year of interesting projects. 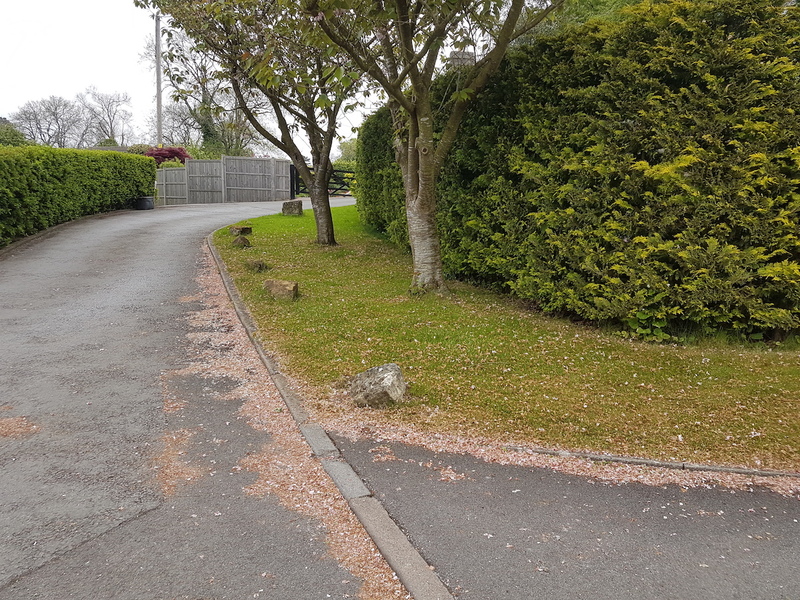 Starting with the Beast from the East the weather was unpredictable with a very late Spring and a very hot Summer. 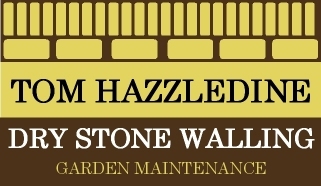 This affects everyone who works outside and of course the state of the walls which are subject to all the changing weather. 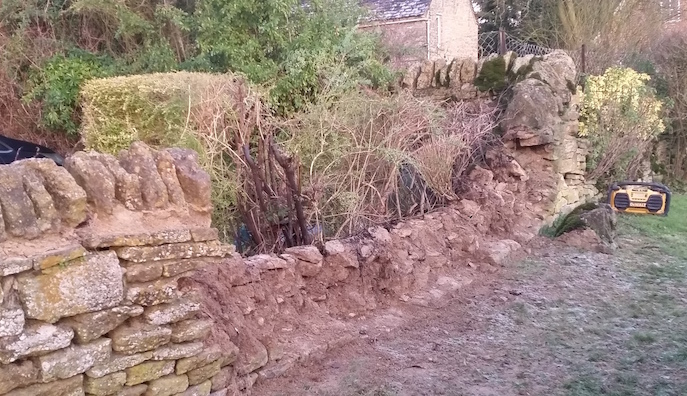 Trees fall on walls, frost erodes them and then in dry weather people think of improving their gardens. 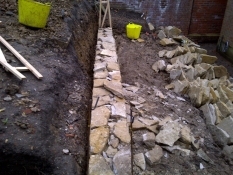 Some work was of course running repairs. 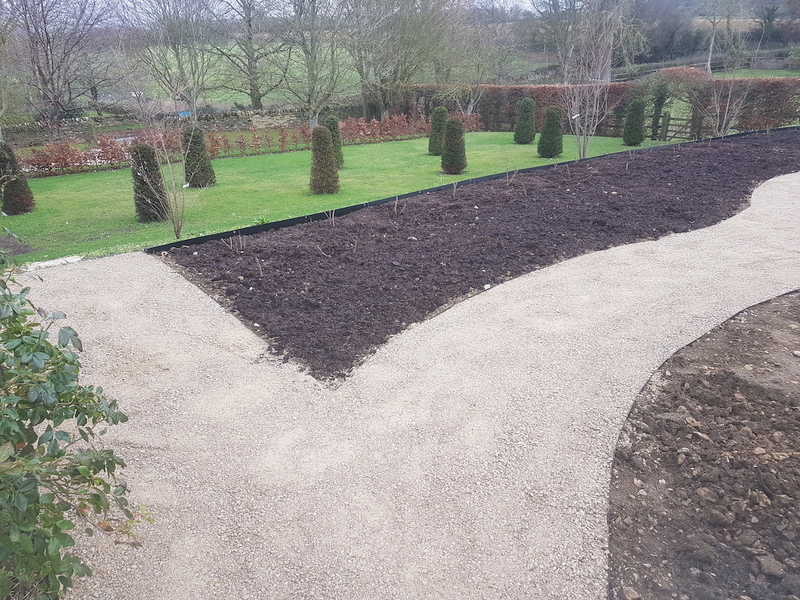 Other projects included large-scale landscaping jobs requiring many different elements including steps, pathways and patios. 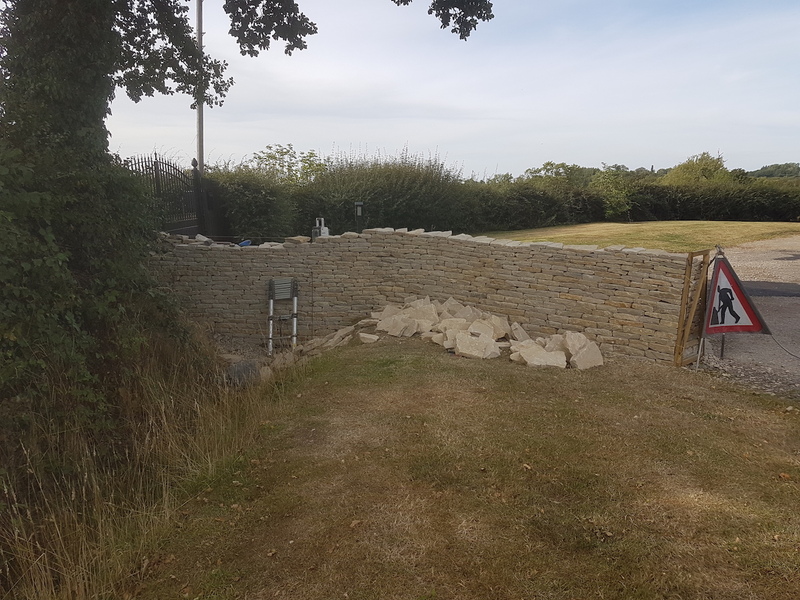 There is enormous value in creating customer loyalty both for the customer and the contractor and Tom has always considered this an important part of his work. 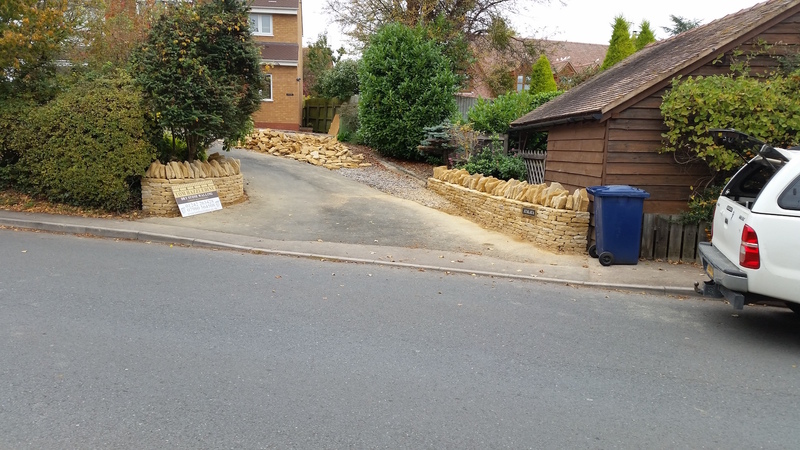 Here are just some of the works completed during the year starting with an emergency fall on to a road. 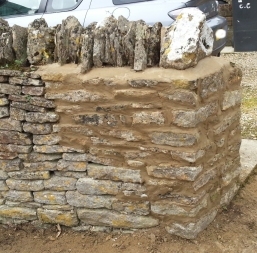 A collapse on to a road - an emergency repair. 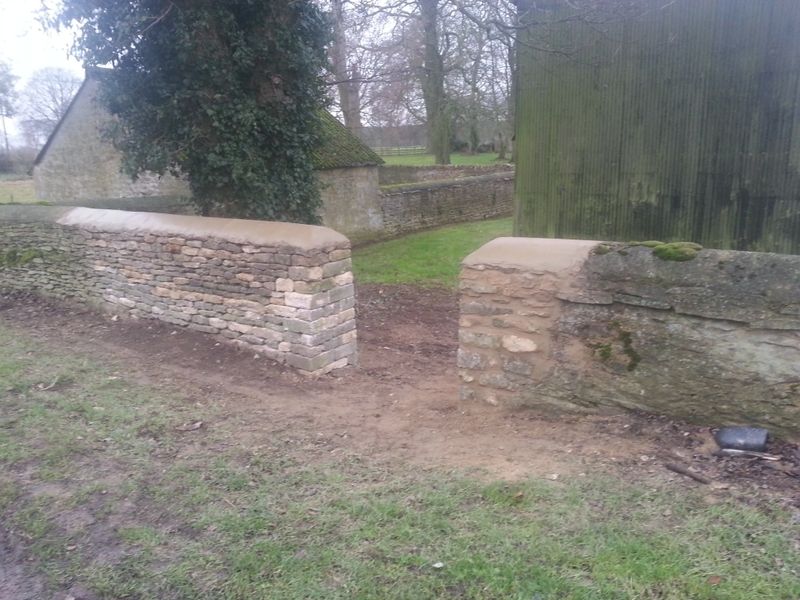 Repaired having left another job to do it. 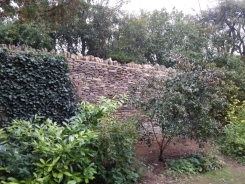 Creation of new paths and walls in a landscape. 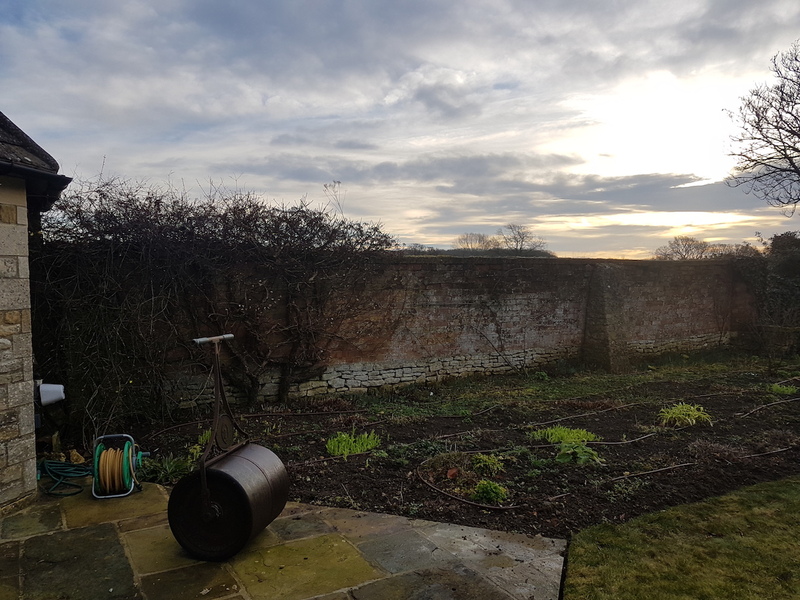 2017 - Its never 'more of the same'. 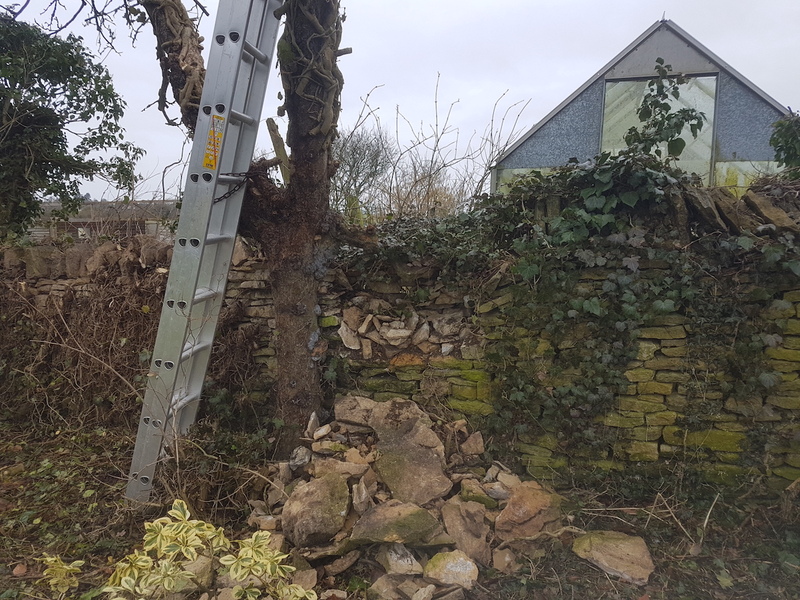 Each job, each year brings different challenges. 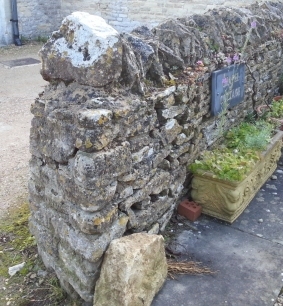 Some greater than others. 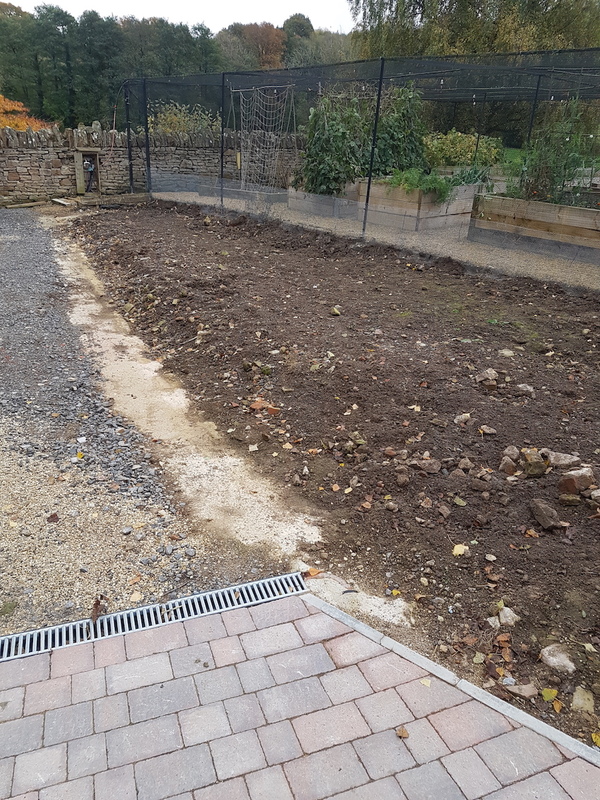 2017 was the same. 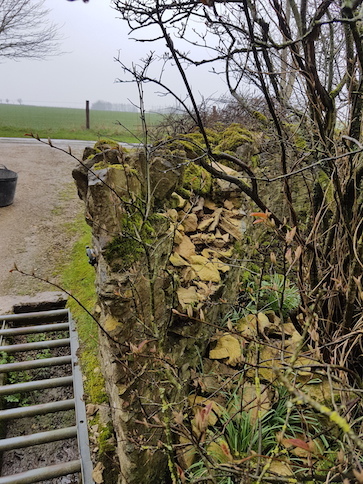 While the previous winter was not so destructive this last has been and so repairs have been non-stop. 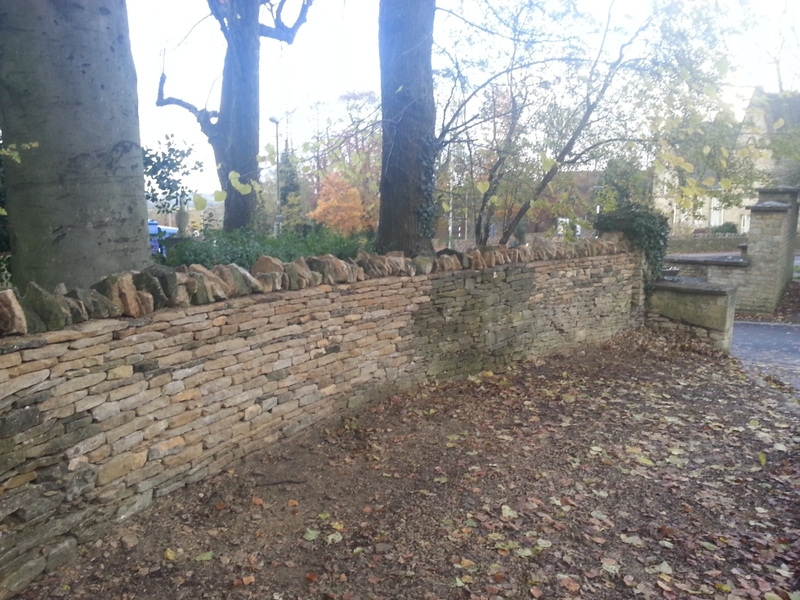 After rebuild which took many weeks and plenty of Health and Safety precautions. 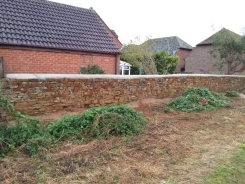 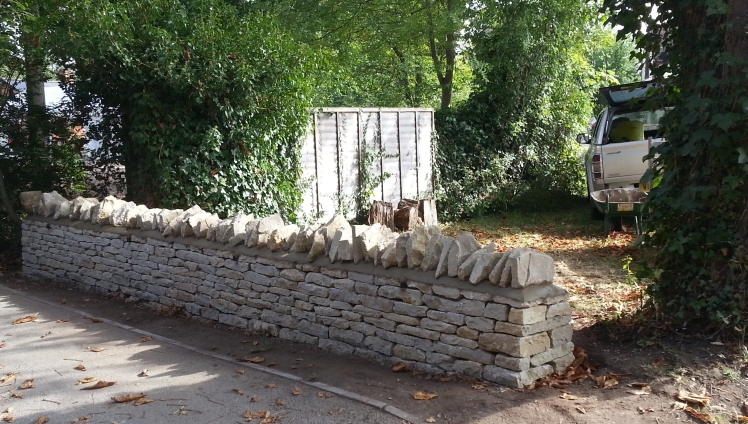 The completely rebuilt wall in Moreton-in-Marsh at a lower height. 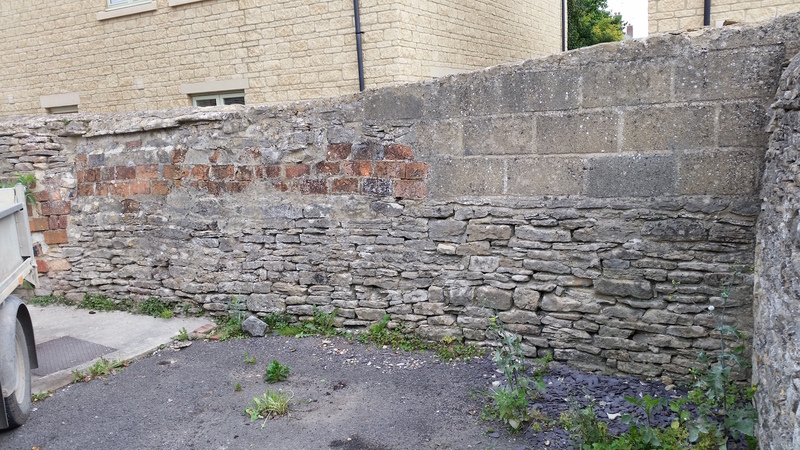 Minchinhampton entrance wall and pillar. 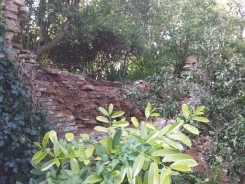 Newent in Forest of Dean. 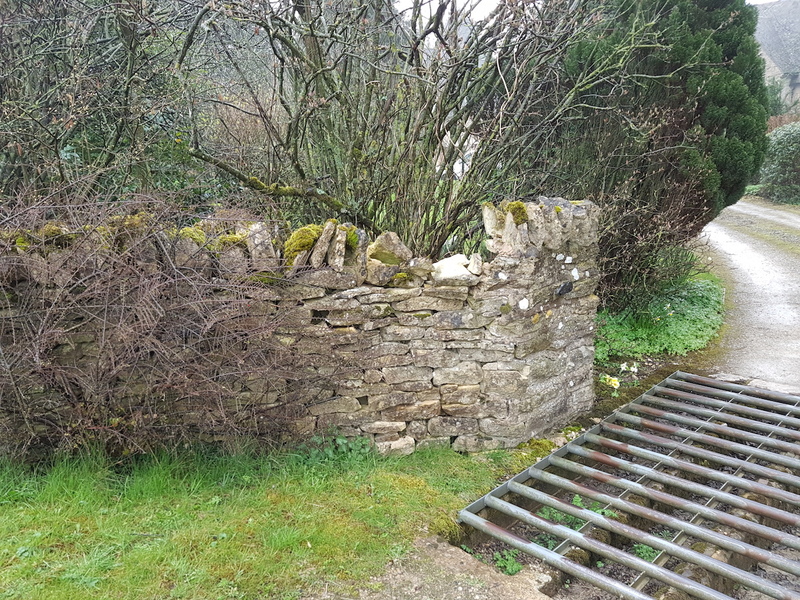 Boundary walls are a special feature of the countryside and we notice them particularly along country lanes. 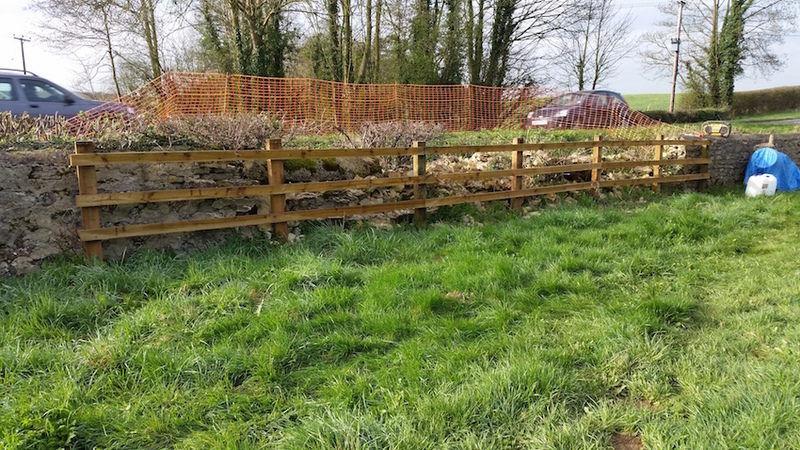 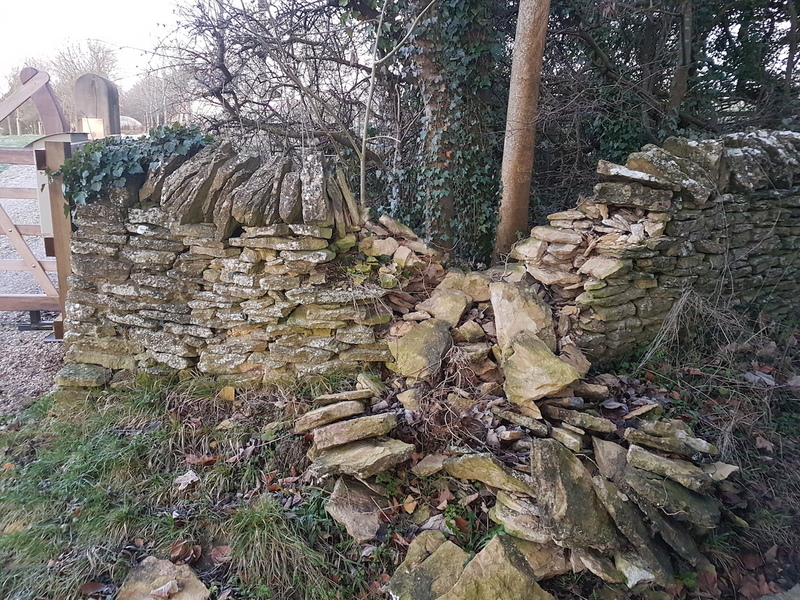 Landowners have the expensive responsibility for their maintenance and it is always worth keeping them in good repair before it becomes a major undertaking. 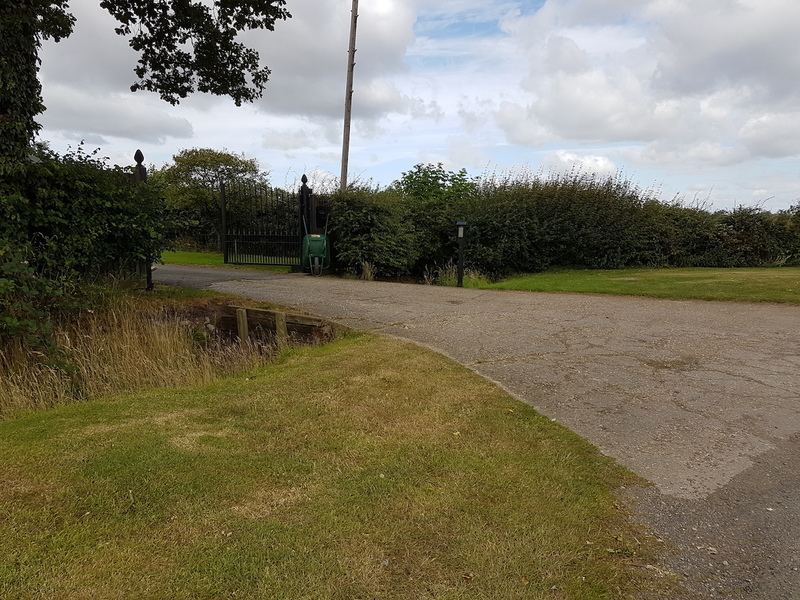 There is little that makes us more happy about returning home than seeing the entrance to our property - however grand. 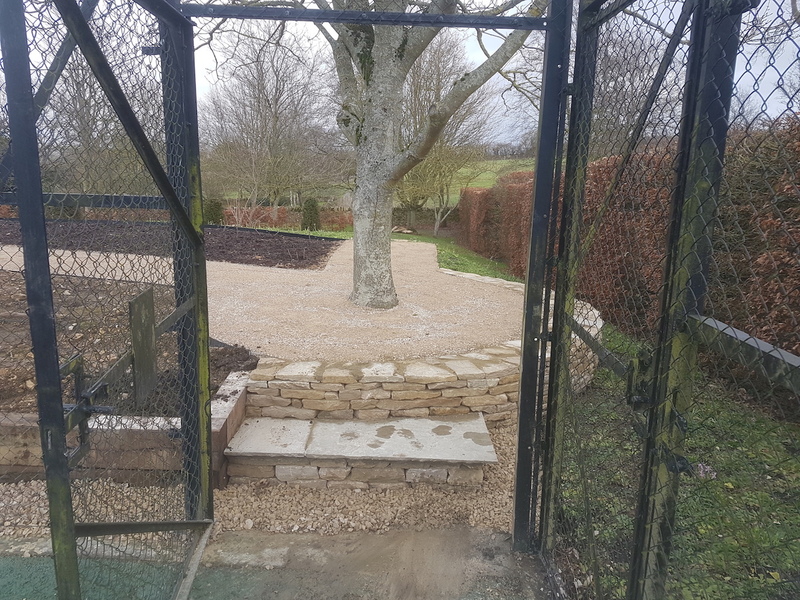 Tom is often asked to rebuild or create new entrances as are shown on this page. 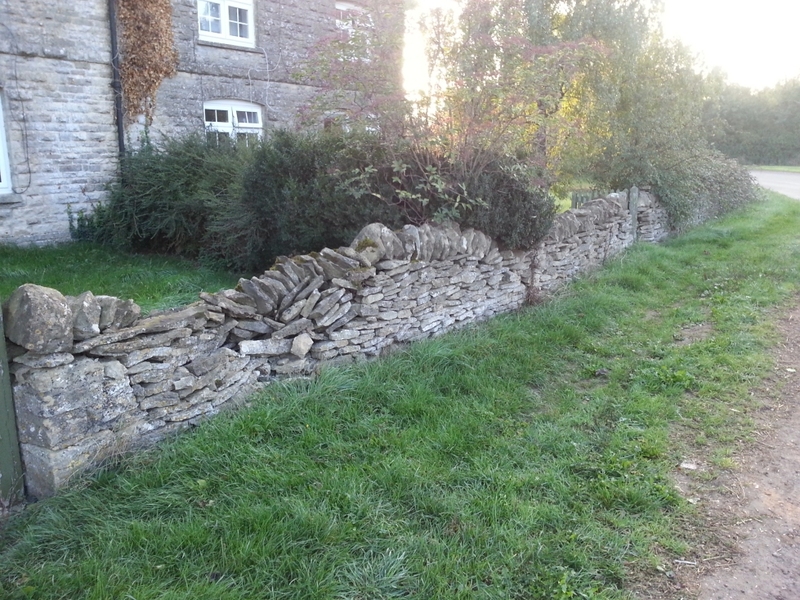 - in Great Rollright, Hazlington above and another in Twyning and outside Aylesbury. 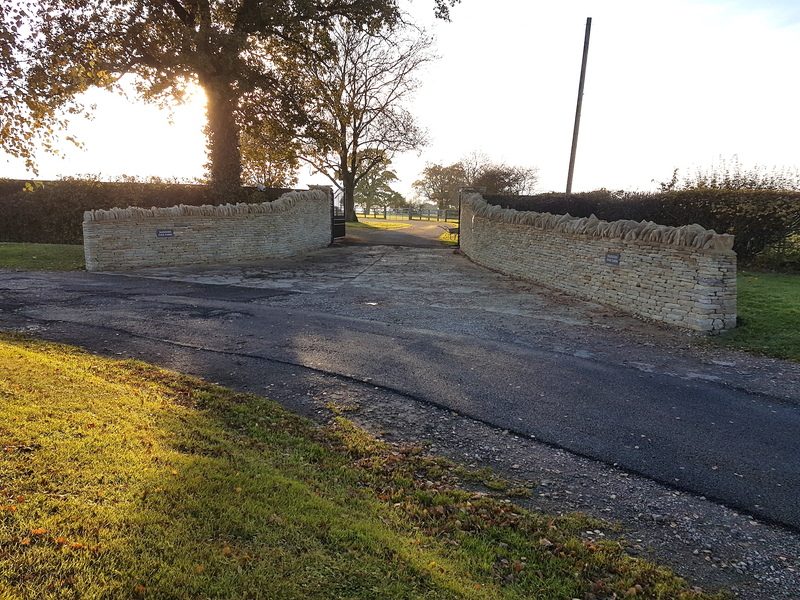 2016 - work continued in a number of counties particularly in Buckinghamshire where an impressive entrance ws constructed. 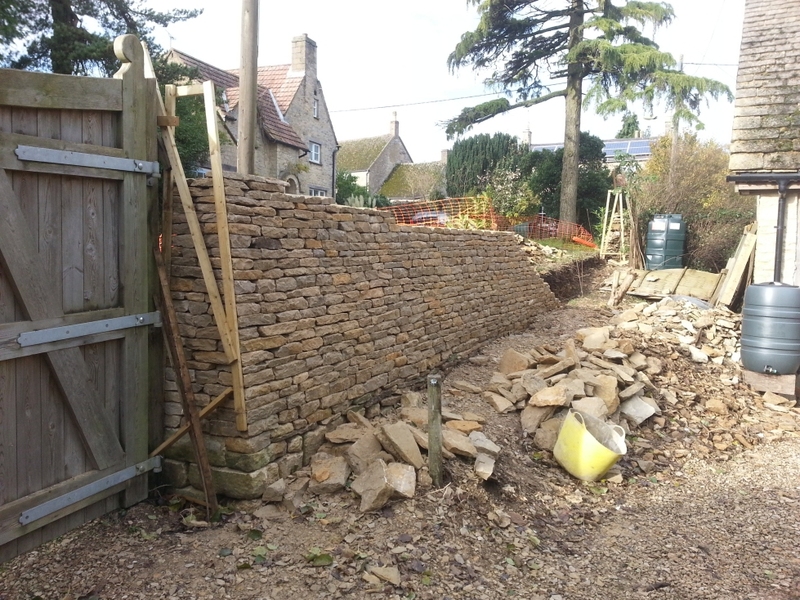 2014 - 15 was hectic with some really important projects finished. 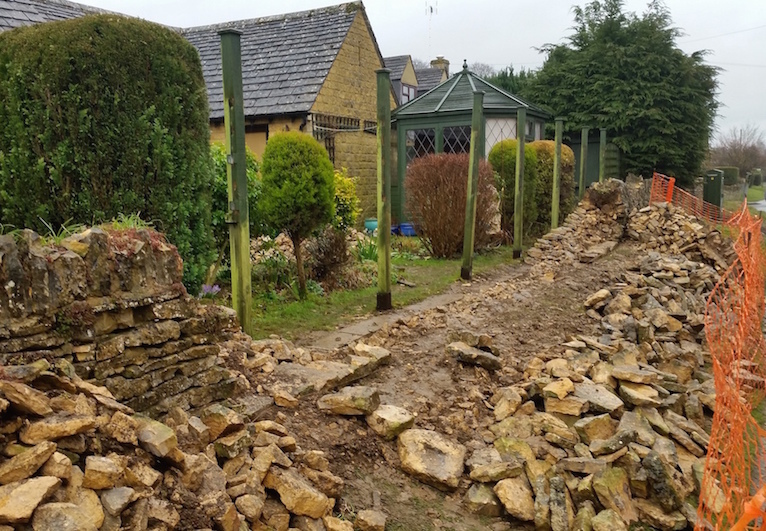 A major repair in Ramsden and another in Middleton Stoney. 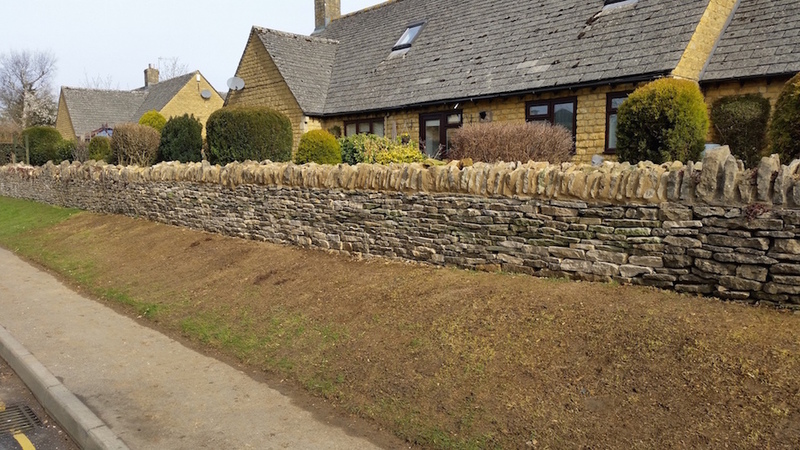 A high wall below in Rollright along with the gravelling and edging of the driveway. 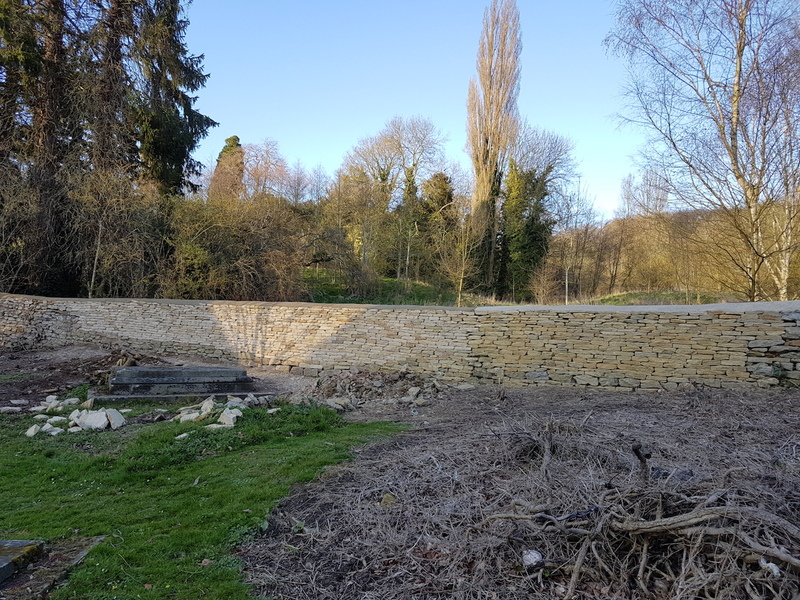 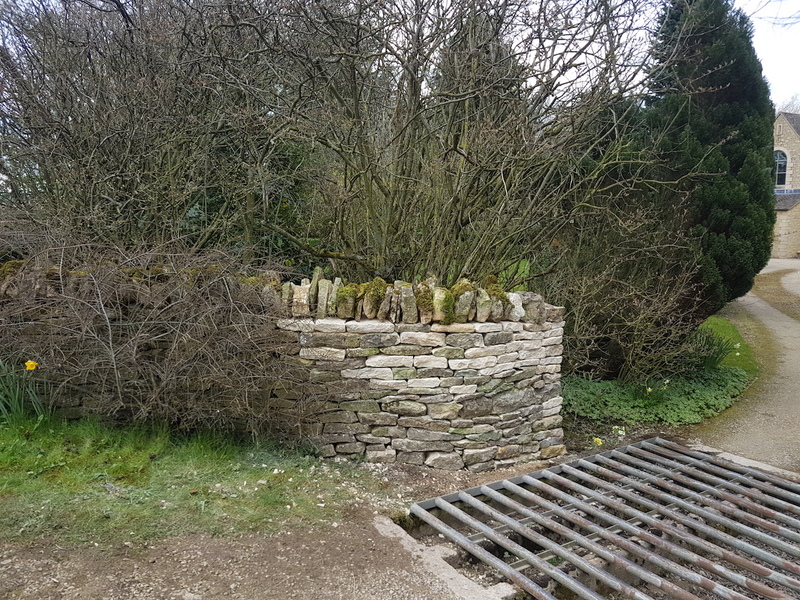 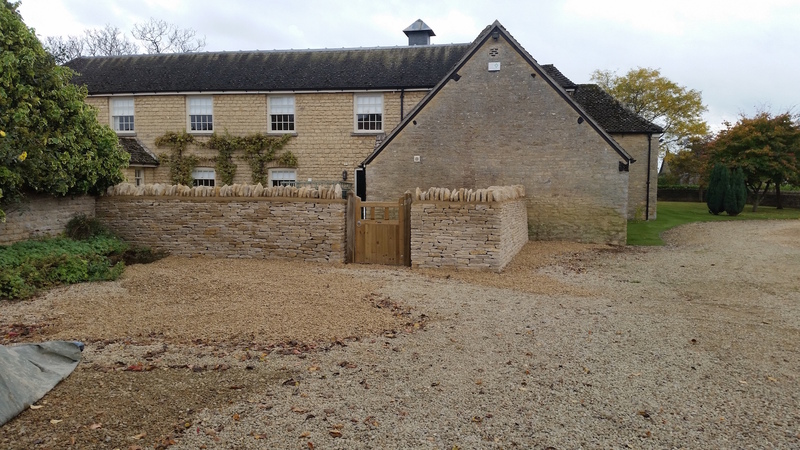 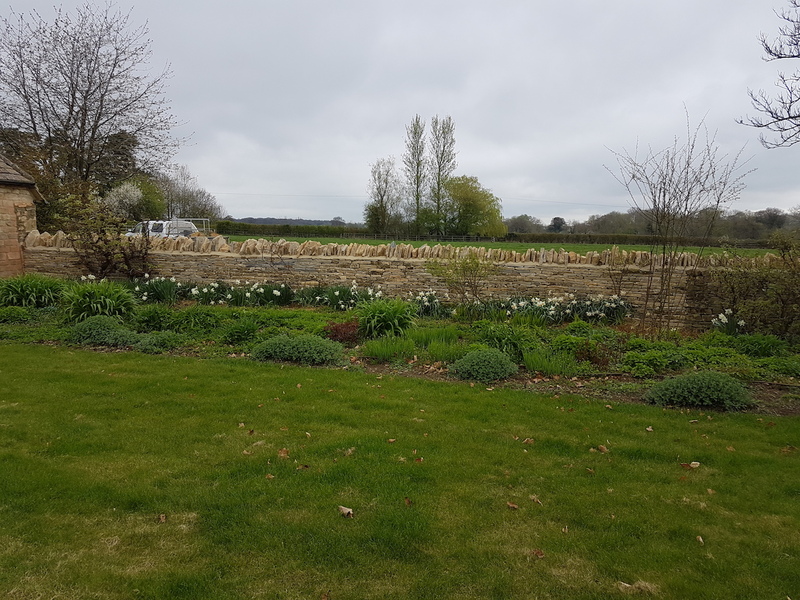 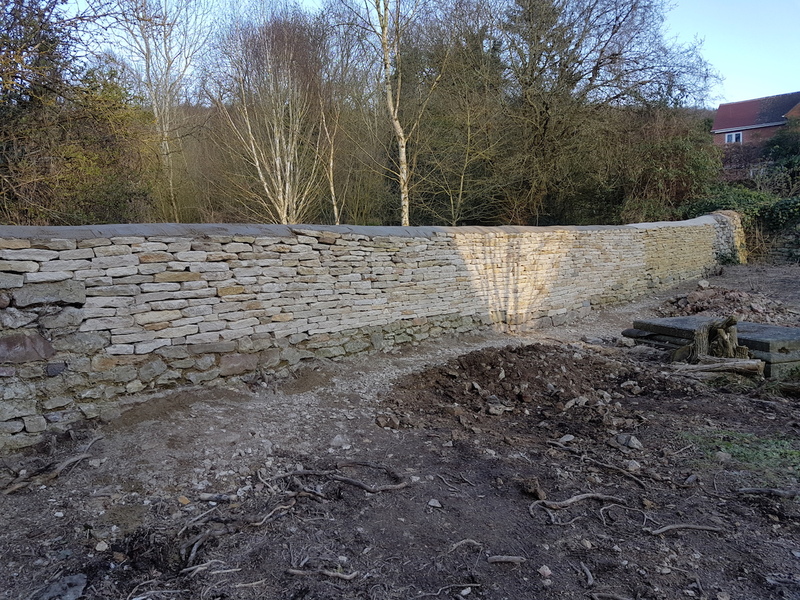 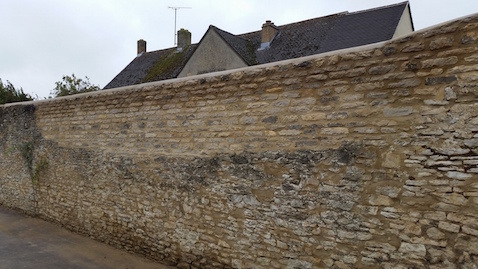 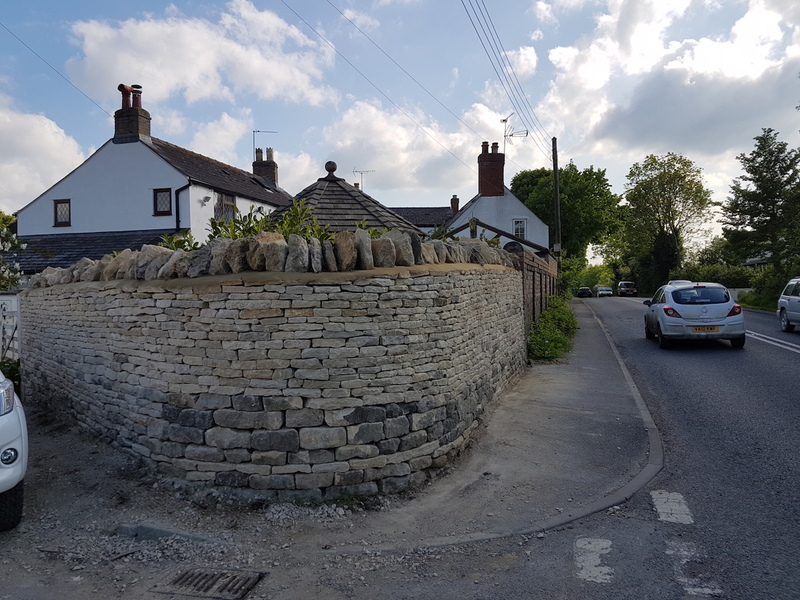 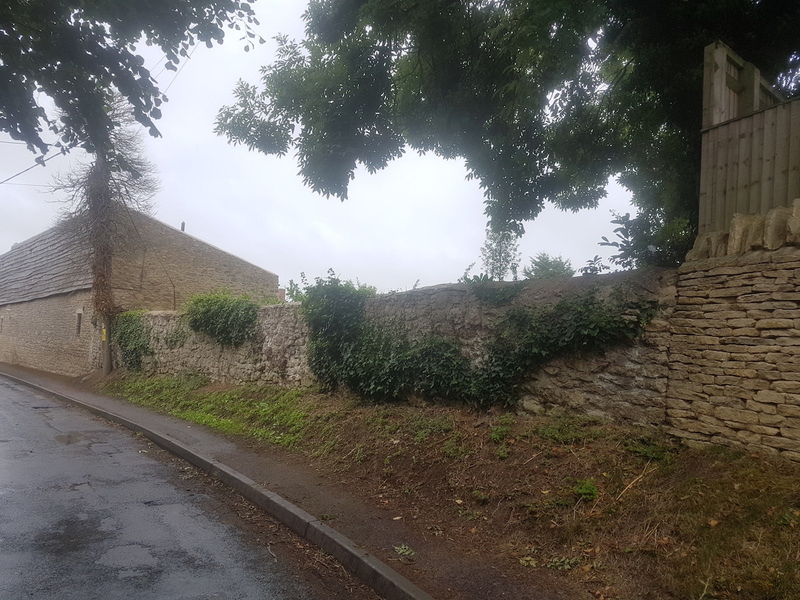 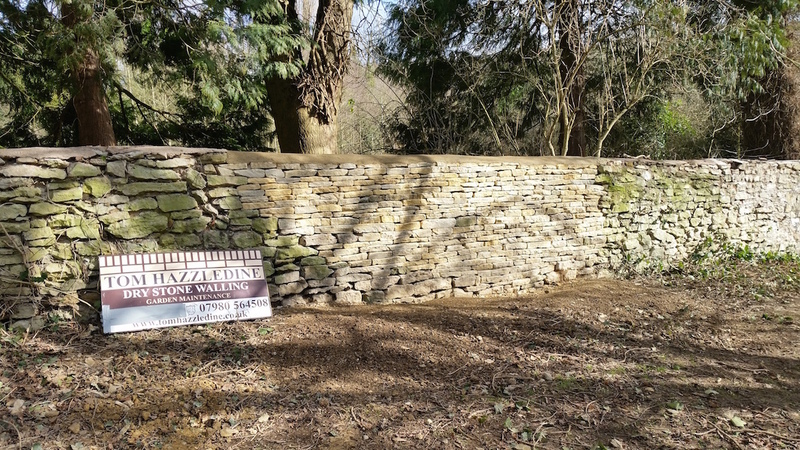 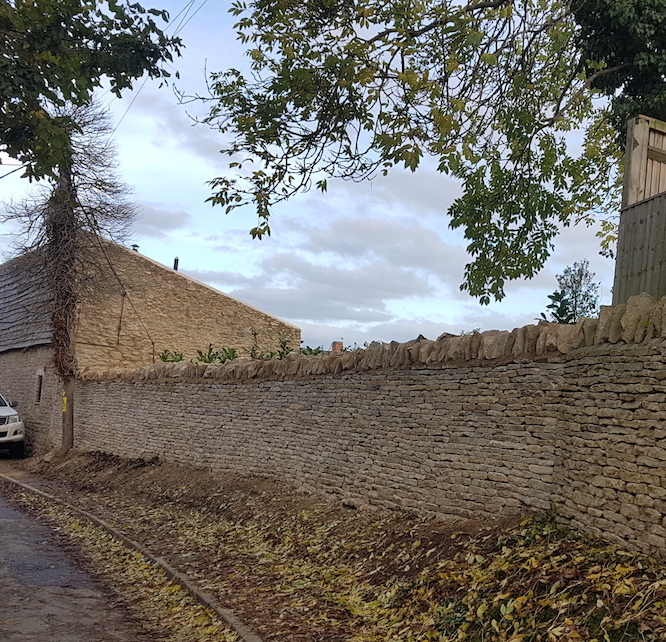 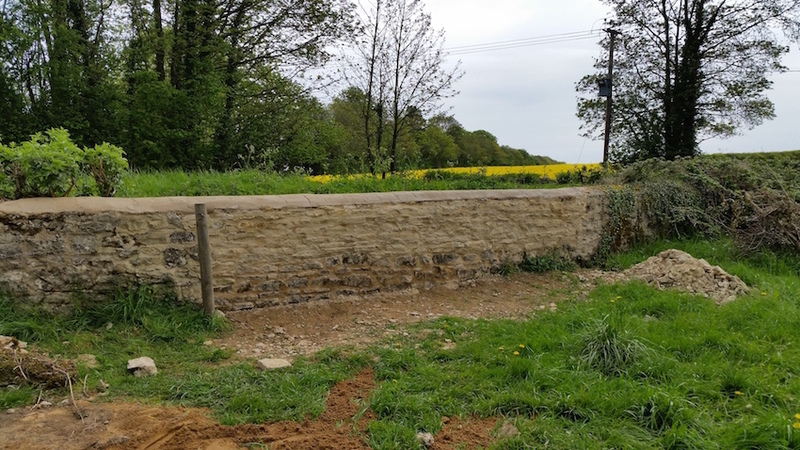 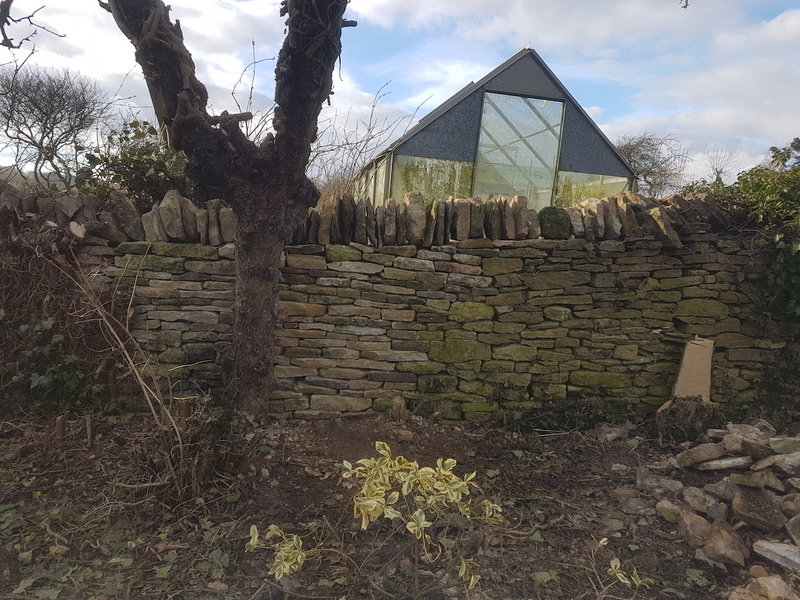 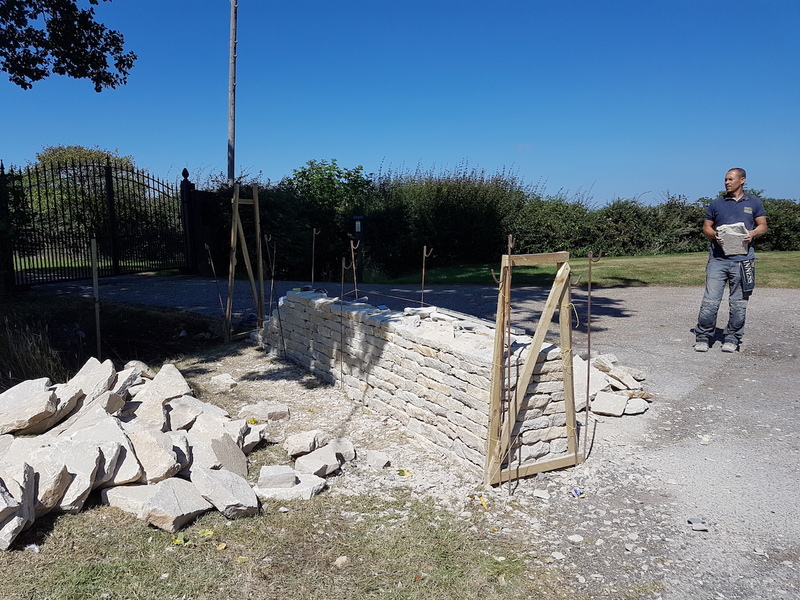 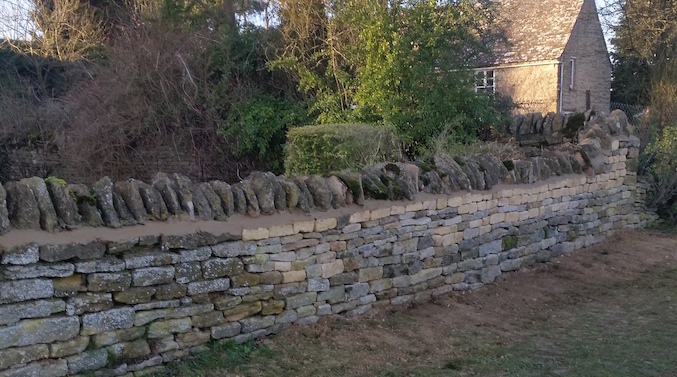 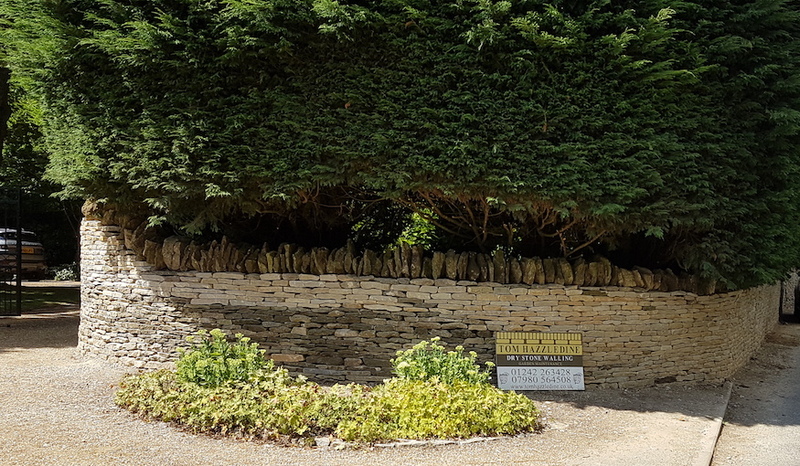 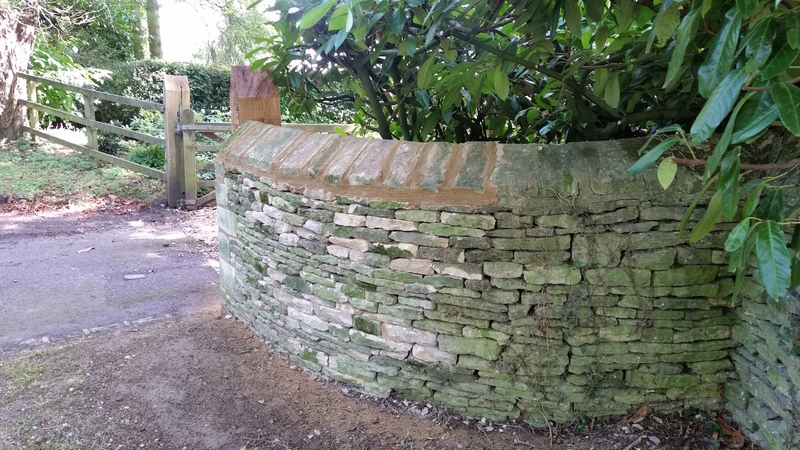 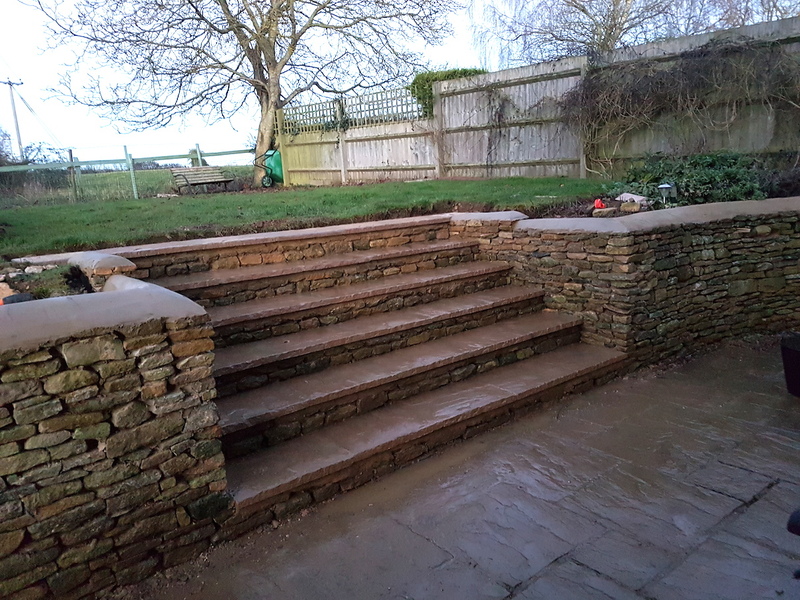 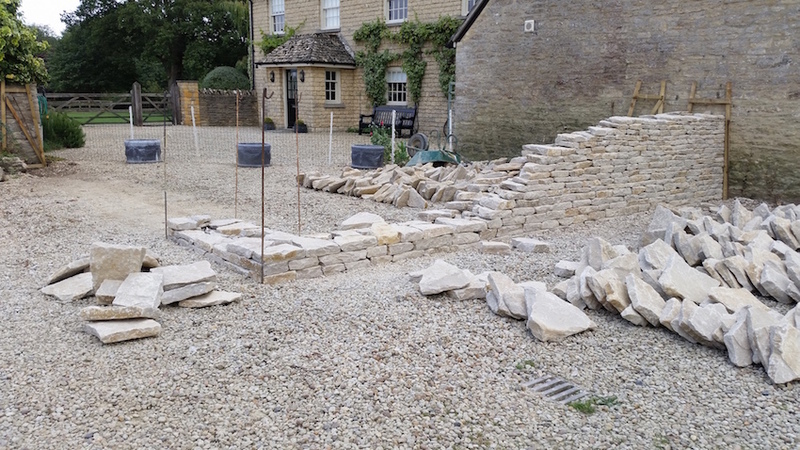 Another high wall (this time mortared) at the Witney Meeting House, a nice curved wall in Wilcote with twice-weathered toppers and a gated enclosure in Freeland are just three more of the finished projects. 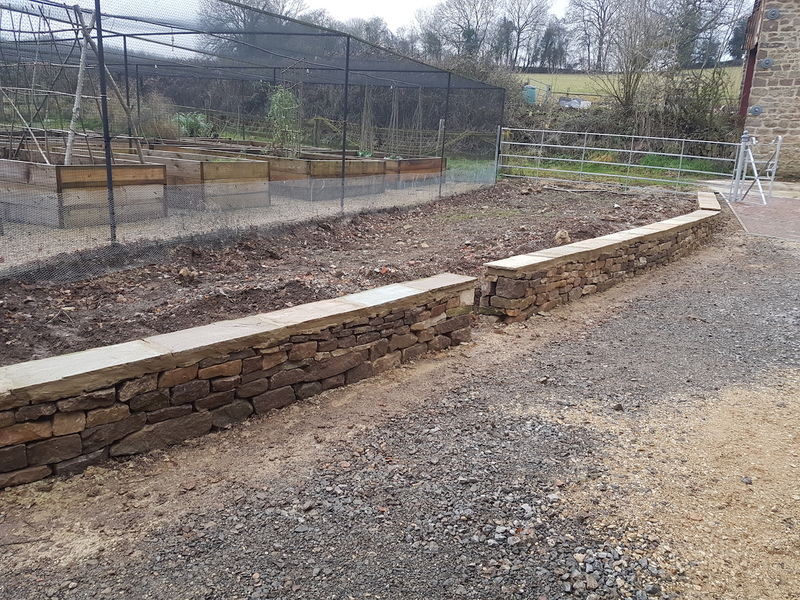 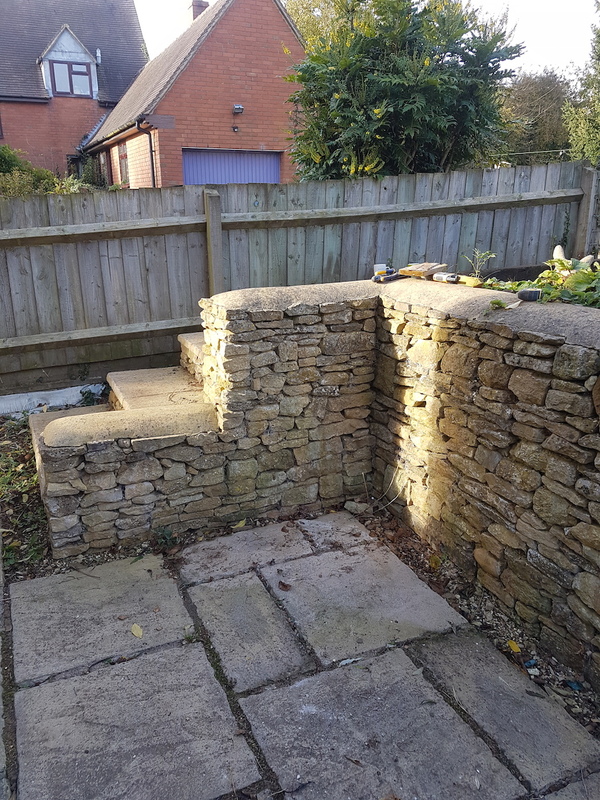 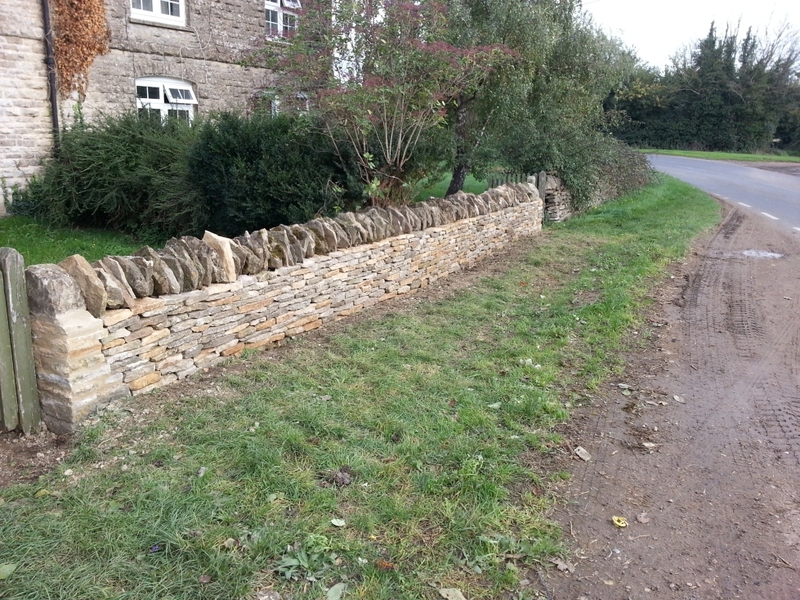 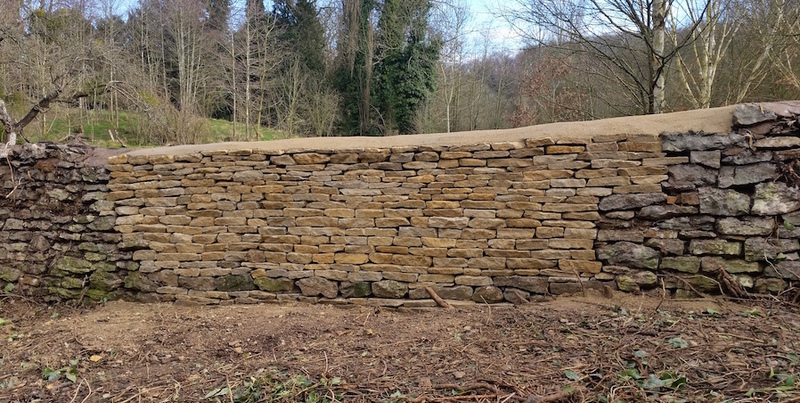 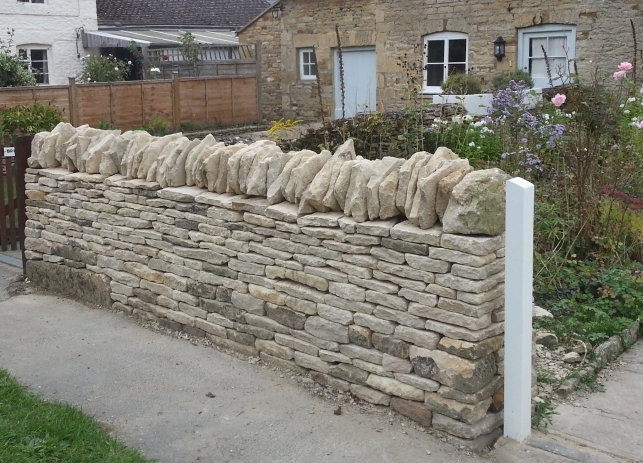 Just some of the varied walling projects Tom has undertaken over the past years. 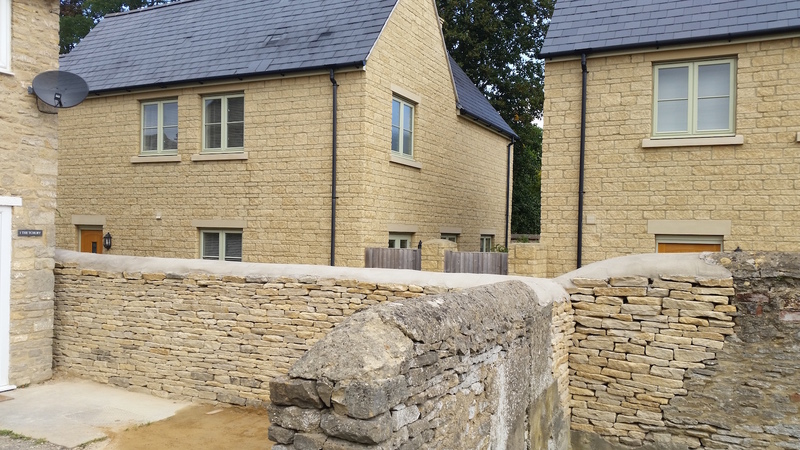 Take a look at the different styles on the website when thinking about a new build. 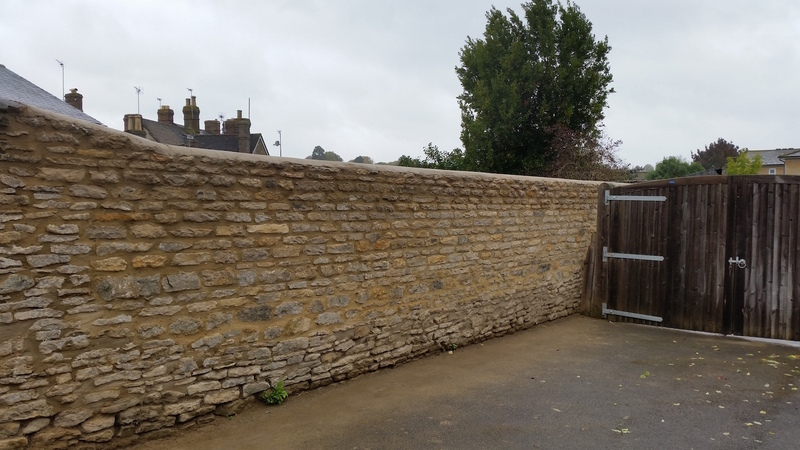 Work was done in Great Rollright (see above) and Kingham as well as Standlake, Middleton Stoney and one in Chipping Norton. 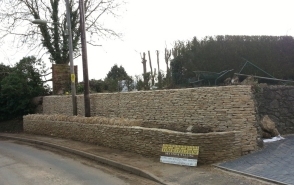 At all times Tom strives for quality so that the walls will stand for many decades to come. 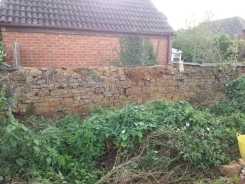 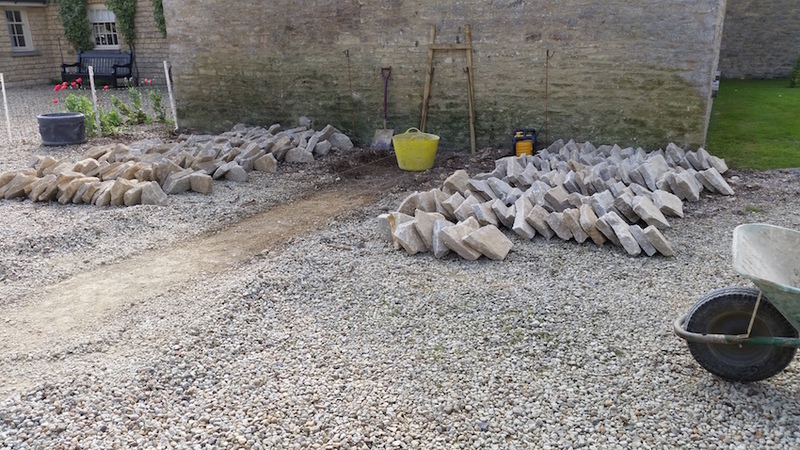 Repair of walls in Middleton Stoney. 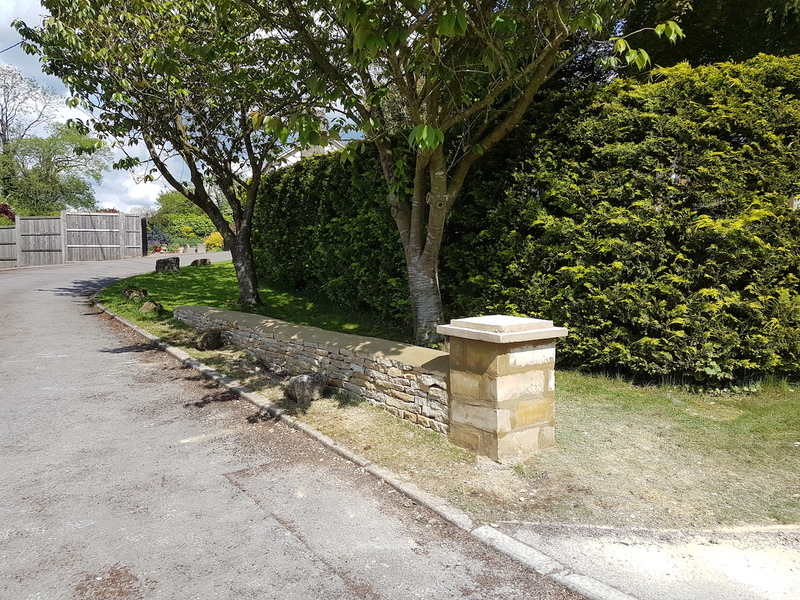 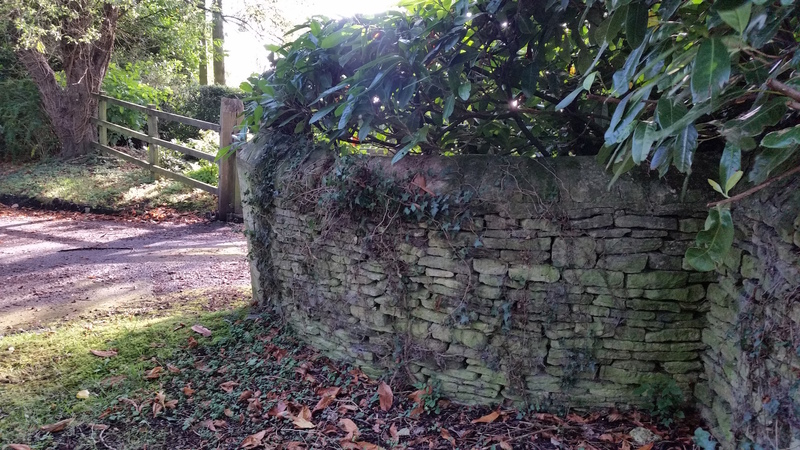 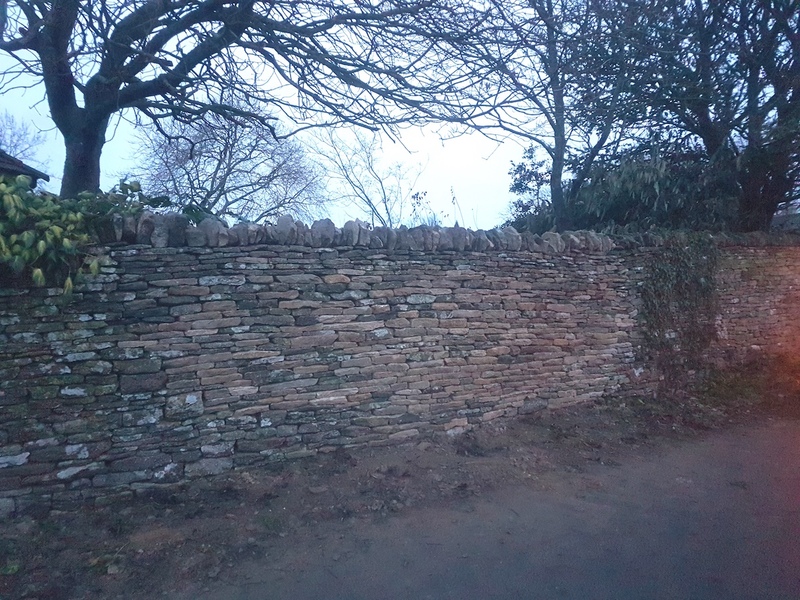 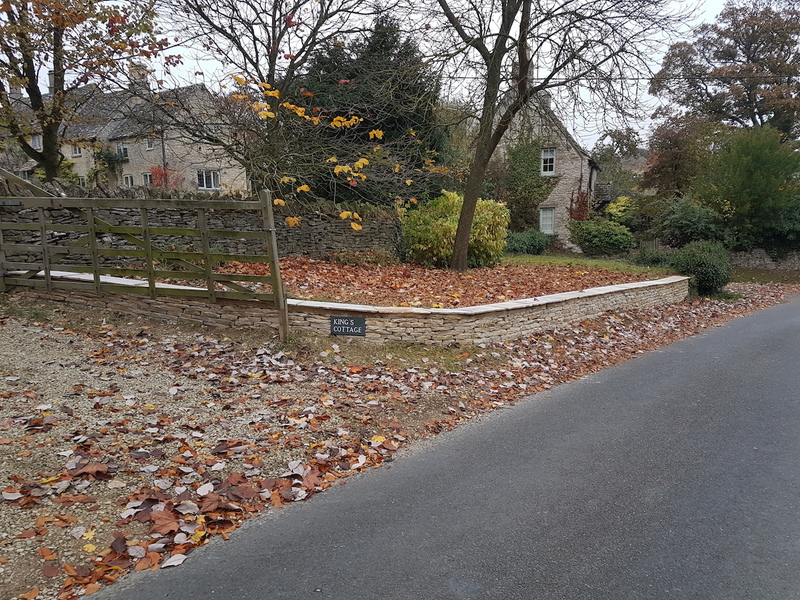 The three photos here are of driveway walls in Twyning. 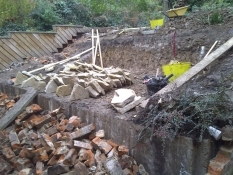 They show the process from nothing to the completed walls. 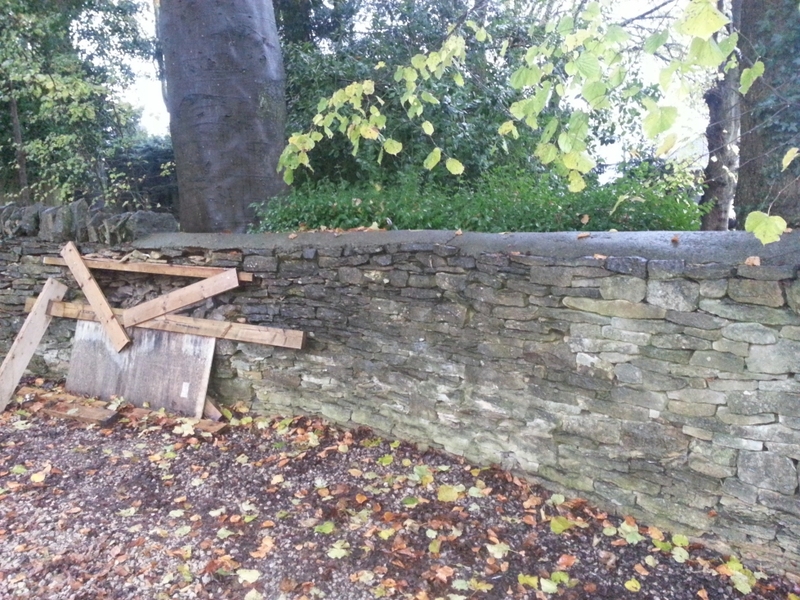 When a wall on the roadside is damaged it becomes a hazard to traffic and pedestrians. 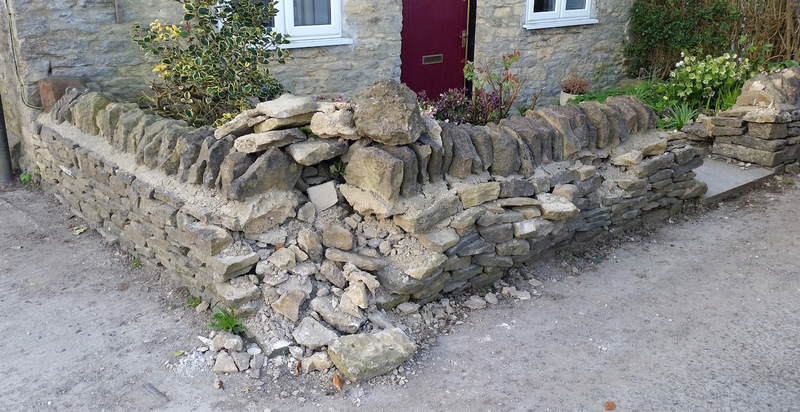 The owner could also be liable for any injury as a result of falling stones. 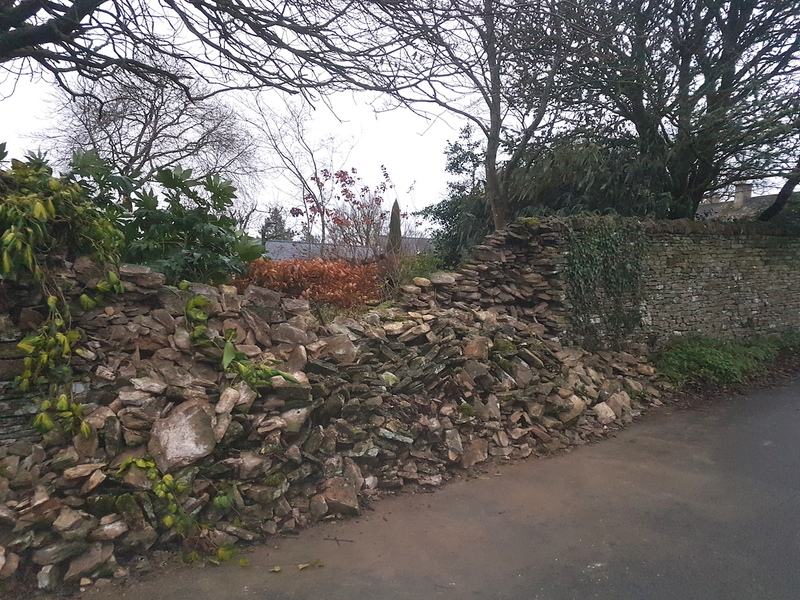 It should always be taped off and loose stone and waste should, where possible, be stored on the opposite side of the wall. 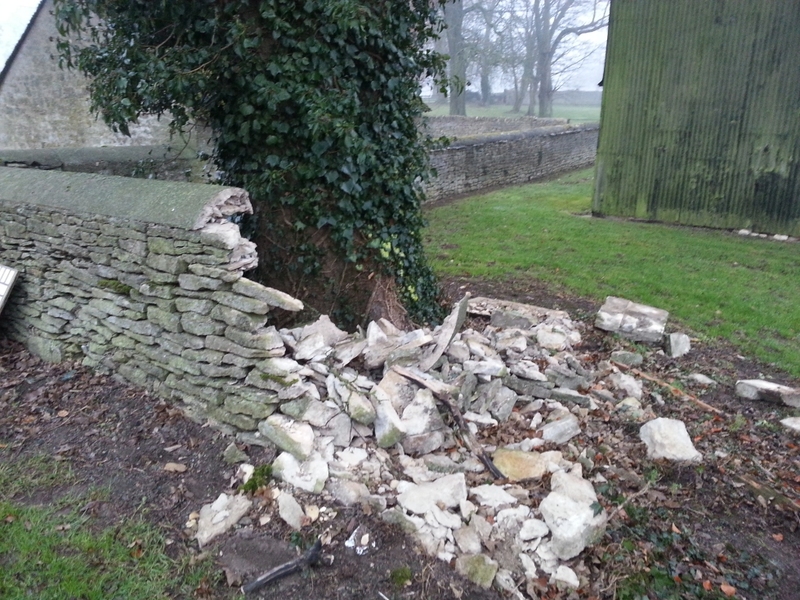 Vehicles frequently damage walls and they are expensive to repair though should be covered by the driver's insurance. 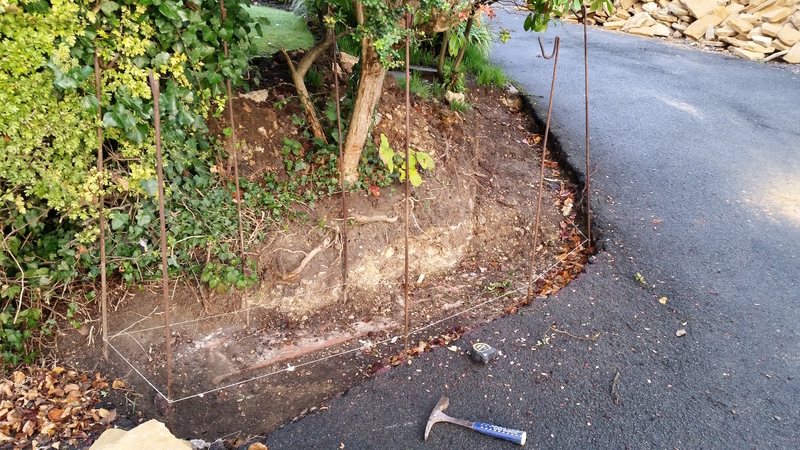 It is also important to have the repair done quickly as the area could be a hazard to pedestrians and cyclists. 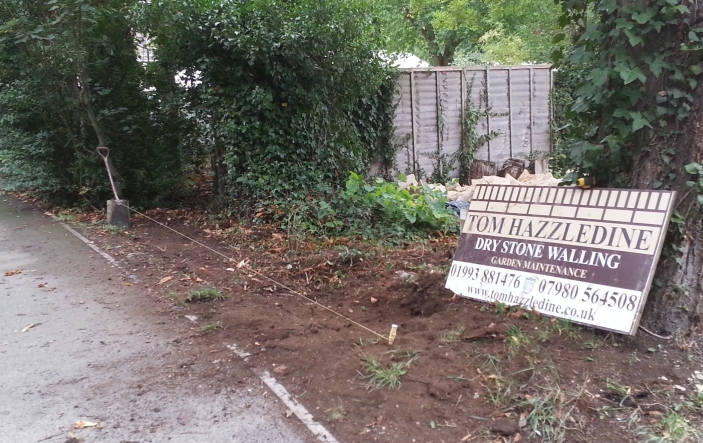 To protect the driveway plywood was laid under the skip. 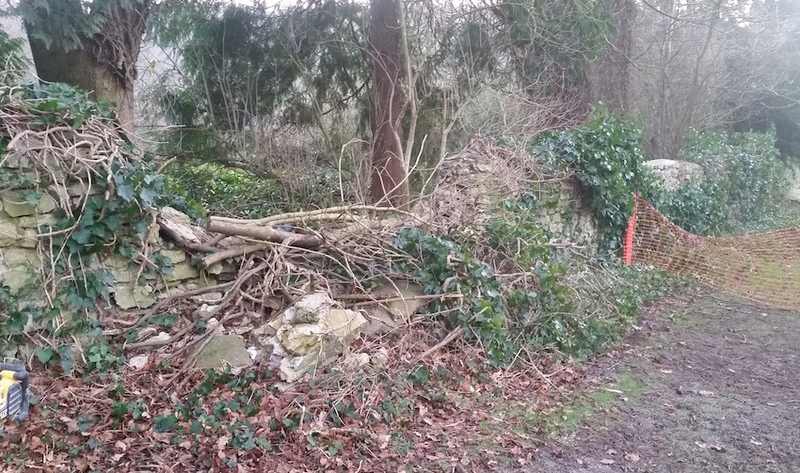 Corner in Northleigh and a much overgrown wall in Great Rollright. 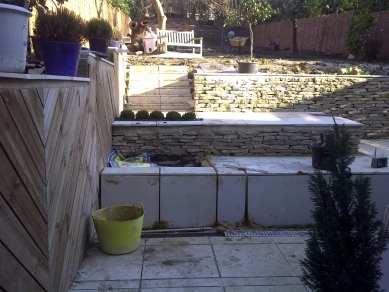 A complete landscaping of a garden in Hampstead with dry stone walls, retaining walls and paving.